I've always been a bit of a wimp. I'm the kid who had no interest in tree climbing, rope swings or water slides. I would be found quietly making daisy chains, drawing pictures and dreamily writing stories about pixies and gnomes. I was the little girl who would shyly hang around the outskirts of the group, waiting to be invited further in. I wanted to observe and work out the social rules before gaining the confidence to make a friend. And though I'm now far from shy and am quietly confident in myself and my abilities, many of those traits remain. But for the first time ever, I find myself in an environment where building relationships isn't as easy as just showing up every day and gradually moving into the social circle. Now I have to actively go and find the social circle in the first place! There is a certain amount of pro-activity involved! I am waaay out of my comfort zone, and as someone who actually enjoys her own company, I have to force myself to do it! So June has been a month for being brave! I've made friends with total strangers, sparked up conversations in supermarket queues and arranged to meet friends of friends who I've never met before! And you know what? The more time I spend actively building relationships with people I didn't previously know, the more I want to do it! My confidence has grown in the process and I find myself seeking out opportunities to meet new people and do new things. The next area that requires courage is in building my freelance portfolio. I've been less proactive since Ruby was born, for obvious reasons, and it's time to jump back on the horse, grab hold of some direction and start getting out there and pitching ideas. 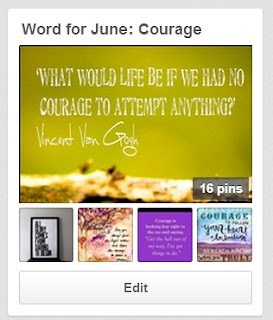 Looking for Courage inspiration? Check out my Pinterest board! You can do it. I was very shy, even bullied at school, but God has shown me, that being me is amazing, and that I am worth knowing. So "just do it" as the trainers ad says. Jump into life and Live!